Ingram Drilling® is a fourth generation, familyowned and operated business. Our family has grown the business to serve seven counties in Colorado and several counties in southeastern Wyoming. We have physical locations in Estes Park and Fort Collins, Colorado as well as Laramie, Wyoming. We have over 80 years of combined experience in the residential, commercial, mining and environmental drilling industries on staff. 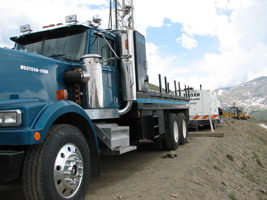 Our modern, up-to-date equipment and utilization of the latest technology assures your well drilling experience is of the utmost in quality, professionalism and workmanship available. We offer a one year warranty on materials and workmanship on all of our projects. This warranty does not include well production rates or quality of water. We also offer complete well permit application assistance to secure your well permit from the proper state agency. We will file the necessary and required completion reports with the proper state agency upon completion of your project.